Here is a bit of a treat for all you old schoolers. Today's mix is made up of some classic mid to late nineties goa-ambient tunes. I quite like this mix because the artists involved are perhaps more well known for their trance tunes played out on the dance floors. These guys were pushing the boundaries back then. The whole psychedelic ambient scene surrounding the parties was full of invention, spiritual intent and a dash of tounge in cheek. First up is a tune from the mighty "The Infinity Project". "Raja Ram", a trained jazz flautist and member of the 1960’s band Quintessence, formed The Infinity Project in 1989 along with "Graham Wood". In December of that year they organised their first party and played their first primitive tracks. Over the next few years The Infinity Project started releasing their first material on labels such as "Fabulous" and "Dragonfly Records". Then in 1994, Raja and Graham , along with "Ian St. Paul", formed the legendary Goa Trance label "TIP Records". 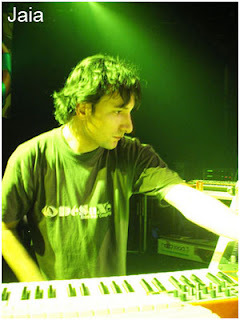 "Simon Posford", although not a full member of The Infinity Project has co-produced/engineered many of their tracks, and has a long-standing friendship and musical partnership with Raja Ram., most notably in their "Shpongle" project Other collaborators include "Martin Freeland" and "Nick Barber". By 1998 The Infinity Project had split-up, with Raja Ram and Graham Wood concentrating on their other projects. If you would like to read more about what Raja was up to back in the day then follow this "link" for a nice little interview with Raja conducted by "Michael Gosney". 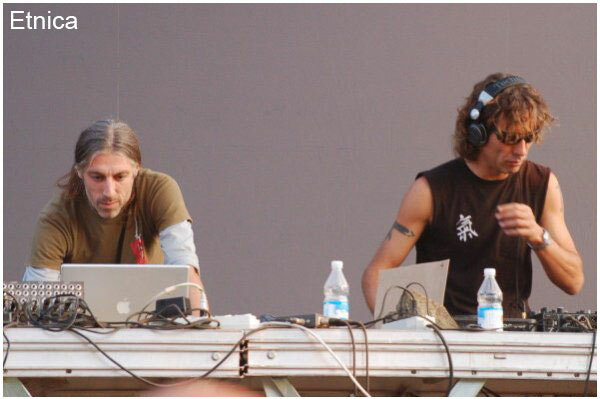 After T.I.P is another almighty group of goa trance legends - the Italian wizards "Etnica". Max Lanfranconi, Maurizio Begotti, Carlo Paterno and Andrea Rizzo met during various parties in Italy at the end of the 1980s. Together they started to compose music in the early 90s. Max was also famous in Milan for the organization of the large all night parties, the first official parties in Italy to last until the morning lights. Andrea had a solid classical music background that combined with the melodies of Carlo and Maurizio's sense of arrangement would soon lead to the production of some of the most classic goa trance tracks ever produced. Their first EP was published on the "Brainstorm" label in 1994. Their first album, "The Juggling Alchemists Under The Black Light", was out the same year on the German label "High Society". This helped the band build a solid reputation in the goa trance scene. Their second album, the classic "Alien Protein", was released in 1996 on "Blue Room Released". Later Carlo had the idea of launching a more psychedelic trance oriented side project, "Pleiadians". Starting off with an EP on "Symbiosis Records" in 1995, they have thus far produced three albums. Even now Pleiadians often rank in the top 5 of all time best goa trance acts. The guys also had another side project in 1997, "Crop Circles", that was a collaboration with another Italian band, "Lotus Omega". In 1999 the band changed their sound, intent on following the worldwide trend from goa-trance to what would become known as psy-trance. Their fourth album, "Nitrox" (2001) is the result of this evolution and worked really well on the dance-floors at the time of release. The following album, "Chrome" (2002) displayed a further development in sound production and clarity and was so successful that they released two versions, one for Europe and one for Japan. Actually , speaking to people around Japan I get a sense that Etnica are perhaps bigger here than in Europe ! Their sixth Etnica album "Sharp" (2004) was liked by old time fans too as it featured a return of melodies but still showed a crystal clear and professional production. In 2006 a seventh album was released, featuring all their best hits remixed by the most famous psytrance producers of the millennium. This one was highly acclaimed by every fan worldwide. The Pleiadians project was relaunched in 2006 with the release of a third opus, an album called "Seven Sisters", that delivered many sci-fi oriented tracks, released on "Harmonia Records". Etnica are still active in the scene and performing DJ sets and Live sets all around the world. Next is "Optic Eye"/"Optica", one of the groups to get a start in the very early 90s on "Kinetix Records". If you weren't around back then you might know Optica's more prolific member "Jake Stephenson" from one of his many other groups/aliases. Jake was known for running the Kinetix label, but also for making music as Shamanic Tribes On Acid, Alien Mutation, Dr. Psychedelic, Mantra, Crystal Moon (together with Ishq), Bass Meditation, Mind Control, Eyetek, Whitestar and off course Optica and Optic Eye. Jake tragically died back in 2005 at the age of 42, right after he had completed the excellent "Paradise & Tranquility" album. After Optic Eye we have another early goa heavy hitter in "Electric Universe" ( aka Boris Blenn ). The project was founded in 1991 in Hamburg, Germany. Being inspired by the first big "Voov Experience" party, some of Boris' first psytrance orientated tracks found their way to "DJ Antaro", who had just started his label "Spirit Zone". The Electric Universe "Solar Energy" maxi single was the second release on Spirit Zone. It turned out to be a big hit and set the ground for the first album "One Love" in 1994. 1997 was the year of the "Stardiver" album, with the monster "Online Information", which blew away the dance floors everywhere. In 1999 "Roland Wedig" joined Electric Universe and the result of the first cooperation was the track "Meteor" on the "Blue Planet" album. This kicking tune, with its expressive guitar lines was played at practically every party for well over a year and probably is the most often played guitar driven psytrance tune of all time. In 2004 “Cosmic Experience” was released including the "The Prayer" track, with its memorable Indian chanting vocals. After Spirit Zone Records closing in 2005 the album was the last one in more than ten years of cooperation with Antaro's label. His chill project "Galaxy" had its first two releases on Blue Room. The third Galaxy album "Science of Ecstasy", released on "Chillcode" in 2005, got No. 1 in the Official German Chill Out Charts. A further Galaxy albumn, "Everlasting Tone", was released just last September. I'm a big fan of the Galaxy sound and recommend checking it out if you enjoy spacey ambient psychedelic music. Okay next up is one of my favorite groups from the later half of the 90's - "Saafi Brothers". My first experience of S.B was probably back around 1996-7. I walked into a local trance music importer shop where they had this kind of glass sculpture display case full of various , err , mind expanding paraphernalia. Inside therein lay , next to some distinctly non musical related goodies , a copy of the newly minted CD "Mystic Cigarettes". One look at the cover and I just knew I had to have it. It didn't disappoint. It was, from start to finish, some of the most amazing music I had ever listened to up to that point in my life. Sadly, the same couldn't be same for what came from S.B thereafter. The follow up album "Midnight's Children" , although good ( especially the track "Wellness Farm" ) , I felt it did not quite live it up to the trip delivered from their debut. The third and fourth CD I didn't bother with at all. I think it was a case of the guys being together and in the right headspace at the right time with their first release. Sliding in next is "Transwave", a goa trance act composed of titans Christophe Drouillet ( "Absolum" ) and Frederic Holyszewski ( "Deedrah" ). 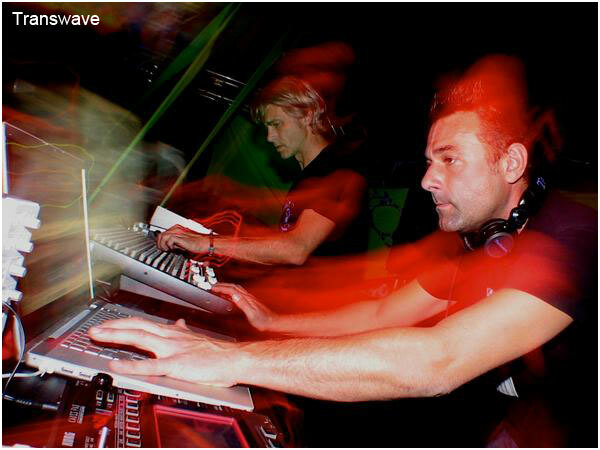 Christophe and Frederic met at a French rave party and subsequently formed the psychedelic trance act Transwave in September 1994. Three months later, the first Transwave release "Datura EP" was launched on the small French label, "Transpact". 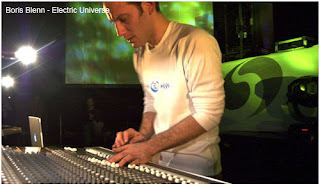 Over the following two years, Transwave released three albums - "Hypnorhythm" 1995, "Helium" 1996 and "Phototropic" 1996 and toured around the world, experiencing great success in the psychedelic trance underground and scoring an international trance hit with their track, "Land of Freedom". The group split in May 1997. 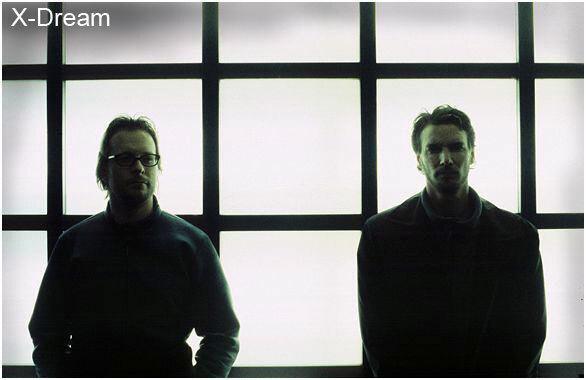 Christophe and Frederic also released an EP called "Anjuna" under the name "Kaledoid" in 1996. In 2007, with talk of reforming the group, a kind of best of compilation, "Backfire", was released on "3D Vision" ( Christophe's own label ). It would actually take until 2009 for them to release the long awaited CD full of new material. If I remember right, it wasn't actually that full of new material anyway and bit of a disappointment in that the new tracks simply sounded like a mix of their respective solo projects they created after the initial breakup. Now this next tune is a bit of a departure from the early goa ambient sound but I put it in here as a bit of a lesson regarding the formation of the new "psytrance" sound that came about around the late 1990's. In many a pundits opinion German trance act "X-Dream" were responsible for the creation of what is now known as psytrance with the release of their album "Radio" in 1998. I'm not sure I agree with that but that this album certainly gave goa-trance a hefty kick to the side lines. The Radio album became immensely popular rather quickly and sold out all the printed copies. It featured a totally new kind of sound which was yet unexplored in the genre. Instead of the complex melodies familiar in prior goa trance releases it featured a more industrial, darker, feel where the melody would become apparent only after several listens. Basslines were more to the fore, the sound was sculptured rather than layered and in a big wide open outdoor dancefield it blew everyone's freaking brains out ! Have a listen to the track in this mix, although it still ambient you can definitely hear the dark edginess and early makings of what was to later come from the psychedelic trance scene. "Jaia" is the progressive house / trance / ambient project of the French producer Yannis Kamarinos. After learning musical theory for a number of years, he played piano and keyboards in some rock bands and produced his first trance tracks back in 1992. In 1995 he formed Jaia with "Jean-Michel Blanchet" and they released their first tracks on "Fairway Records". The first Jaia album “Blue Energy” was released in 1998 and re-released in 2000 as a double CD with a 6 tracks bonus CD under the name of "Blue Energy/Blue Synergy" ( "Dakini/Yellow Feather" ). Jaia released several 12 inches too , as well as numerous tracks on various compilations. Since 2000 Yannis has been working alone under the Jaia name. He released the album "Fiction" on "Digital Structures" in 2005, which fused psychedelic sounds with fat atmospheric progressive trance and house. In 2009 his 3rd album "Re:Works" came out on "Tribal Vision", containing brand new remixes of Jaia's biggest hits by such outstanding and diverse remixers as Martin Roth and Vibrasphere . However it is the debut "Blue Energy" CD for which Jaia is most loved. With tracks like "Mai Mai" and "After the Rain" it remains an emotion filled goatrance classic. Guitars in trance music while somewhat passe now, was a relatively new thing in the late 90s and one group at the forefront of that idea was "S.U.N Project". In fact they were so successful at it that they became a bit typecast for it. I think that is not entirely fair though as apart from being rather skilled at catchy guitar hooks they were also exceptional producers and created some of the funkiest psytrance basslines going around. This tune is one of their rarer ambient outings and can be found on their debut release "Drospophila" on "Spirit Zone Recordings". Here is a two part interview with New Zealand's dub techno ambient wizards "Pitch Black". Try to catch them live ( outdoors ) if you can - one of the best shows I've ever experienced.